Fungus Relief Homeopathic Salve 1 oz (Puremedy) - Penn Herb Co. Ltd.
Puremedy Fungus Relief Homeopathic Salve temporarily relieves symptoms associated with skin and nail fungus. 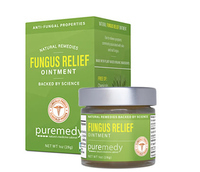 Temporarily relieves symptoms associated with skin and nail fungus. Apply topically as needed, or as directed by your physician. Cover with a non-absorbent bandage. Do not use gauze. Use only as directed. SEE PDF LABEL FOR ADDITIONAL DIRECTIONS & WARNINGS.